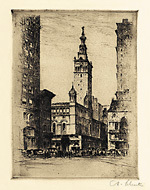 Madison Square Garden- - c.1922, Etching. Edition 50. 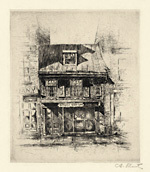 Signed in pencil. Titled in pencil, in the bottom left sheet corner. Image size 6 3/16 x 4 5/8 inches (157 x 117 mm); sheet size 11 9/16 x 8 7/16 inches (294 x 214 mm). 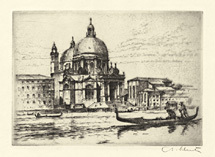 A fine, rich impression, in warm black ink, with overall plate tone, on cream wove paper, with full margins (1 1/2 to 3 7/8 inch), in excellent condition. 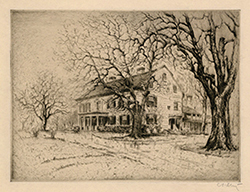 Washington's Headquarters- - 1925, Etching. Edition not stated. Signed and annotated 3rd State, First Proof in pencil. Image size 4 3/4 x 6 1/4 inches (121 x 159 mm); sheet size 9 1/8 x 9 7/8 inches (232 x 251 mm). A fine, rich impression, on cream wove paper, with full margins (1 3/8 to 3 inches), in excellent condition. 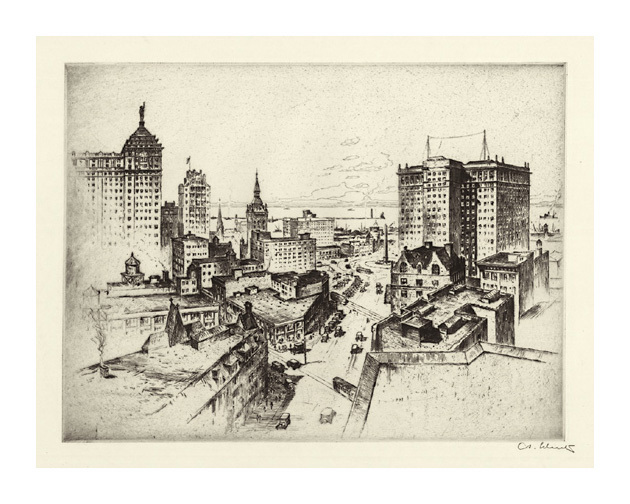 Heart of Detroit- - 1927, Etching. Image size 8 13/16 x 11 13/16 inches (224 x 300 mm); sheet size 12 x 18 1/8 inches (305 x 460 mm). 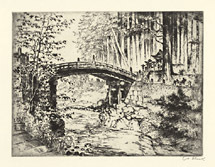 A fine impression, on cream wove paper, with margins (1 1/2 to 3 1/8 inches). 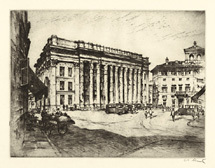 Bowling Green- - 1927, Etching. 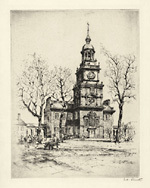 Edition 50. 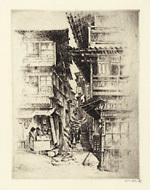 Signed and in pencil; titled in the artist's hand, in the bottom left sheet edge. Annotated only 50 impressions Plate Destroyed in pencil, in the bottom center margin. Image size 14 15/16 x 10 9/16 inches (379 x 268 mm); sheet size 17 5/16 x 13 1/8 inches (440 x 333 mm). A fine, rich impression, on cream wove paper, with full margins (1 to 1 3/8 inches), in excellent condition. Image size 13 1/2 x 10 inches (343 x 254 mm); sheet size 16 7/8 x 12 5/8 inches (429 x 321 mm). A fine, rich impression, on cream wove paper, with margins (1 1/16 to 2 1/4 inches), in excellent condition. 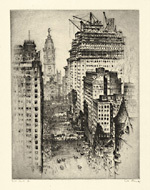 Three Giants- - 1927, Etching. Image size 13 5/8 x 10 1/16 inches (346 x 256 mm); sheet size 18 1/2 x 13 7/8 inches (470 x 352 mm). A fine, rich impression, on cream Japan, with wide margins (1 7/8 to 2 7/8 inches), in excellent condition. 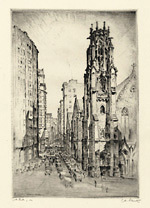 Christ Church Cathedral, St. Louis- - c.1927, Etching. Edition not stated. Signed and annotated 3rd State, a in pencil. Signed and dated in the plate, lower left. Image size 11 5/8 x 7 3/4 inches (295 x 197 mm); sheet size 14 5/8 x 11 3/8 inches (371 x 289 mm). A fine, rich impression, on cream wove paper, with full margins (1 3/8 to 1 3/4 inches), in excellent condition. 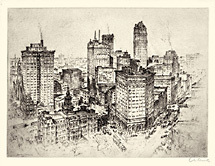 10th Street and Bell Building, St. Louis- - 1927, Etching. Image size 11 7/8 x 8 7/8 inches (302 x 225 mm); sheet size 14 7/8 x 11 7/8 inches (378 x 302 mm). A fine, rich impression, on cream wove paper, with full margins (1 1/2 inches), in excellent condition. 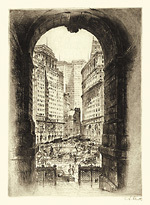 The Canyon of Olive Street, St. Louis- - c.1927, Etching. 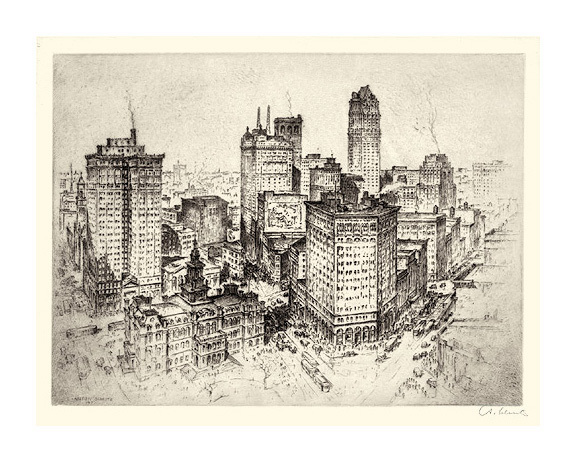 Image size 11 7/8 x 7 1/2 inches (302 x 191 mm); sheet size 14 7/8 x 11 7/8 inches (378 x 302 mm). A fine, rich impression, on cream wove paper, with full margins (1 3/8 to 2 1/2 inches), in excellent condition. 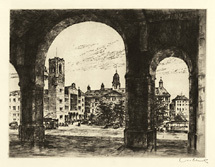 Cleveland Public Square- - 1927, Etching. 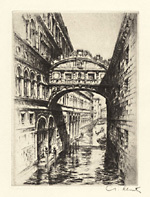 Image size 11 7/8 x 8 7/8 inches (302 x 225 mm); sheet size 18 1/8 x 12 inches (460 x 305 mm). A fine, rich impression, on cream wove paper, with full margins (1 5/8 to 3 3/8 inches), in excellent condition. 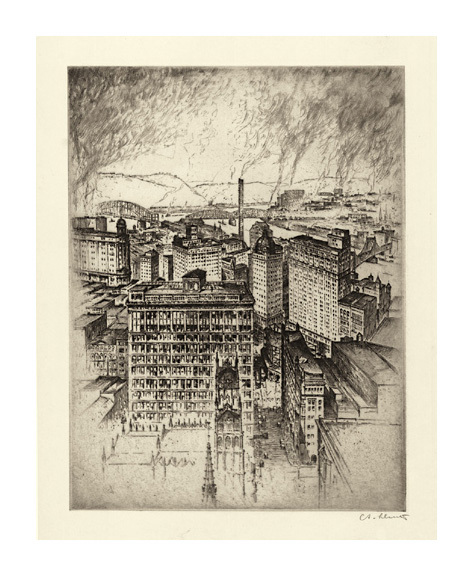 Cleveland Looking Over the Flats- - 1927, Etching. Edition not stated. Signed and annotated 2nd State, e. in pencil. Signed and dated in the plate, lower left. Image size 8 7/8 x 11 7/8 inches (225 x 302 mm); sheet size 12 1/4 x 14 7/8 inches (311 x 378 mm). 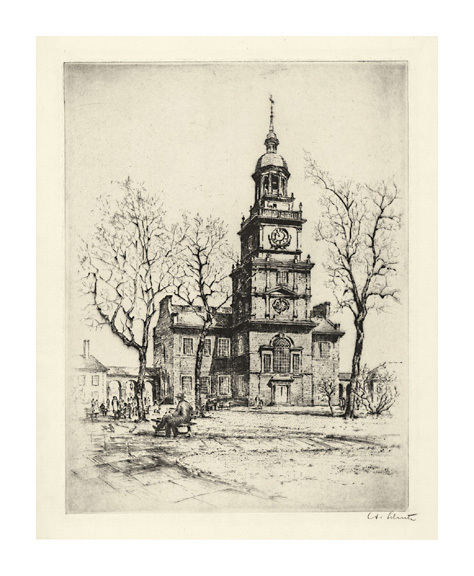 Baltimore Financial Center- - c.1927, Etching. Edition not stated. Signed and annotated Second State, b in pencil. Image size 13 7/8 x 10 inches (352 x 254 mm); sheet size 19 x 13 7/8 inches (483 x 352 mm). A fine, rich impression, on cream wove paper, with full margins (2 to 3 1/4 inches), in excellent condition. 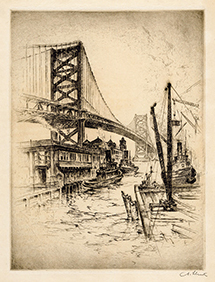 Delaware Bridge- - c.1927, Etching. 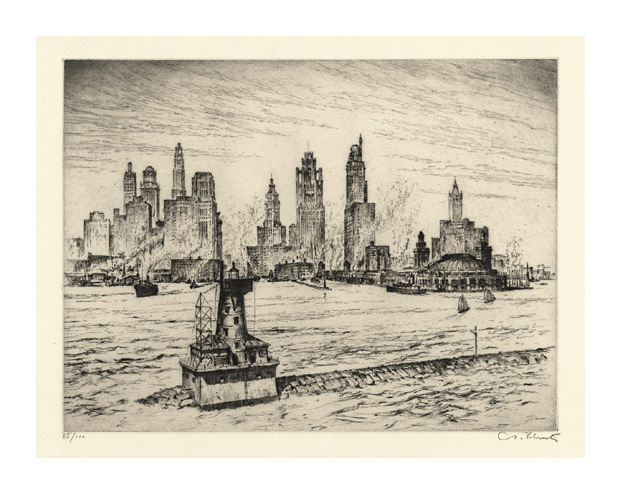 Image size 11 7/8 x 8 7/8 inches (302 x 225 mm); sheet size 15 1/2 x 11 1/8 inches (394 x 283 mm). A fine, rich impression, on cream wove paper, with full margins (1 1/8 to 2 1/4 inches), in excellent condition. 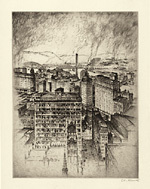 Spirit of Pittsburgh- - c.1927, Etching. 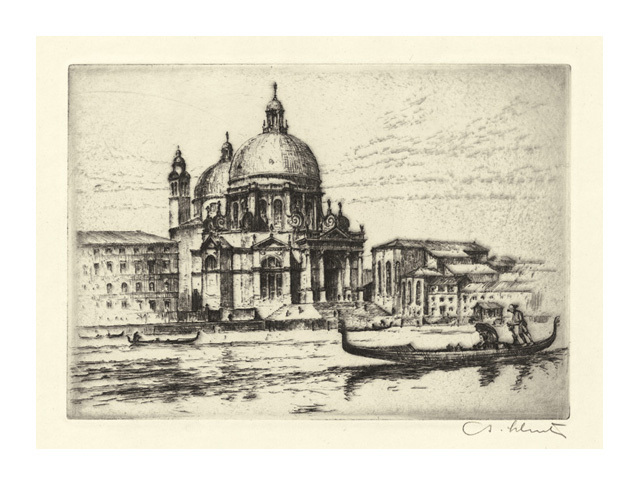 Image size 11 7/8 x 8 7/8 inches (302 x 225 mm); sheet size 16 1/4 x 12 1/4 inches (413 x 311 mm). A fine, rich impression, on cream wove paper, with full margins (1 3/8 to 2 3/8 inches), in excellent condition. 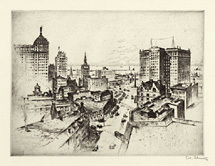 Spirit of Buffalo- - c.1927, Etching. Image size 8 7/8 x 11 7/8 inches (225 x 302 mm); sheet size 12 5/8 x 16 1/8 inches (321 x 410 mm). A fine, rich impression, on cream wove paper, with full margins (1 3/4 to 2 inches), in excellent condition. 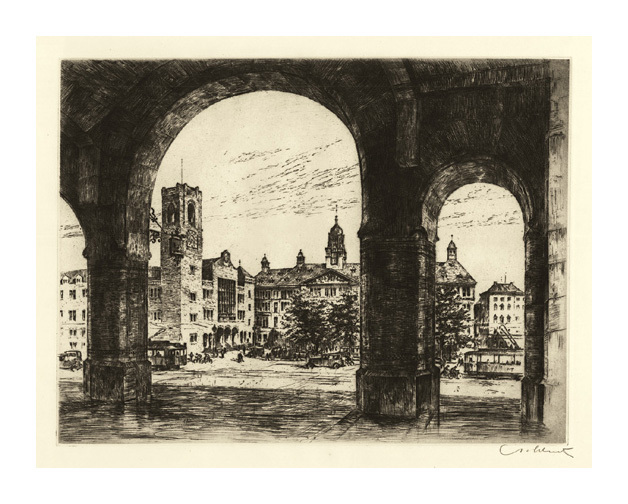 Chicago Civic Opera House- - c.1927, Etching. Edition 100. Signed and numbered 63/100 in pencil. 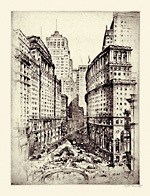 Image size 11 7/8 x 8 7/8 inches (302 x 225 mm); sheet size 17 3/4 x 11 3/4 inches (451 x 298 mm). A fine, rich impression, on cream wove paper, with full margins (1 1/2 to 3 3/4 inches), in excellent condition. 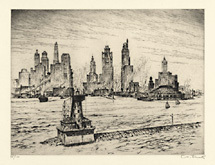 Chicago Harbor- - c.1927, Etching. Edition 100. Signed and numbered 80/100 in pencil. 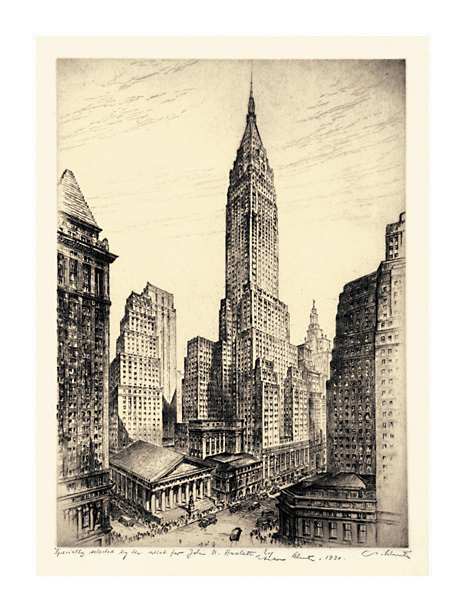 Image size 8 3/4 x 11 7/8 inches (222 x 302 mm); sheet size 12 x 17 3/4 inches (305 x 451 mm). A fine, rich impression, on cream wove paper, with full margins (1 1/2 to 3 1/8 inches), in excellent condition. 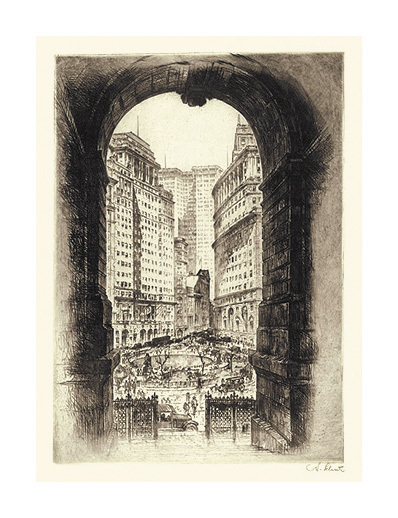 Heart of San Francisco- - c.1927, Etching. 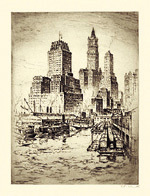 Image size 11 7/8 x 8 7/8 inches (302 x 225 mm); sheet size 18 1/8 x 13 7/8 inches (460 x 352 mm). A fine, rich impression, on cream wove paper, with full margins (2 1/2 to 3 5/8 inches), in excellent condition. 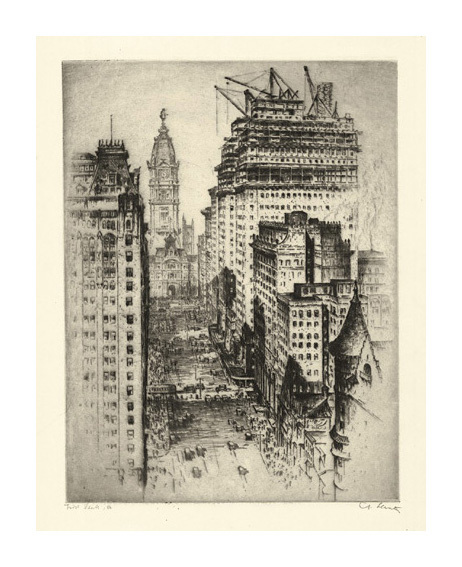 Philadelphia, Broad Street- - c.1927, Etching. Edition 100. Signed and annotated First State, a in pencil. 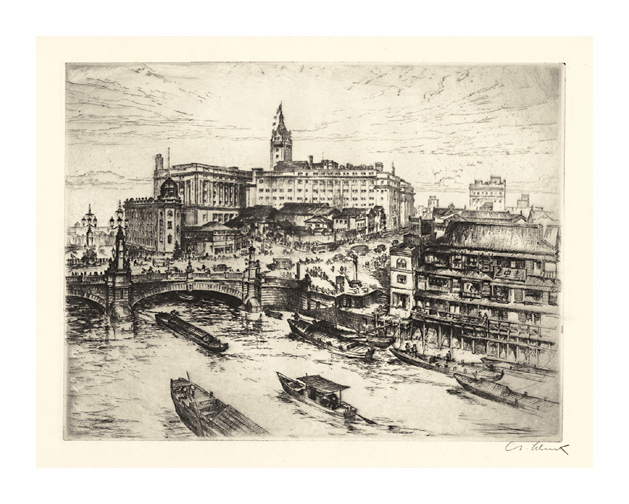 Image size 11 7/8 x 8 7/8 inches (302 x 225 mm); sheet size 16 1/8 x 13 3/4 inches (410 x 350 mm). A fine, rich impression, on cream wove paper, with full margins (1 3/8 to 2 3/4 inches), in excellent condition. 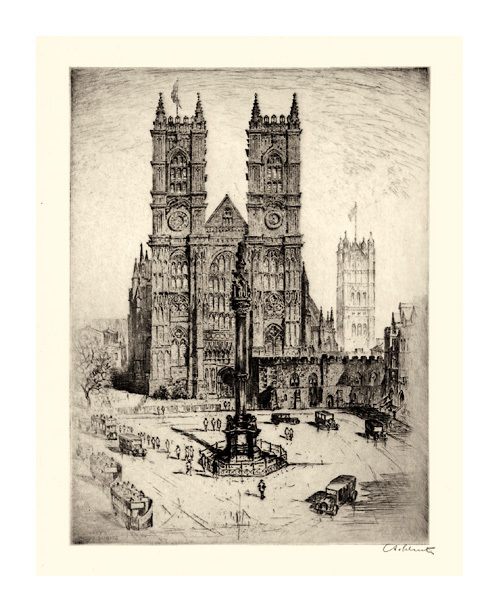 Westminster Abbey- - 1927, Etching. 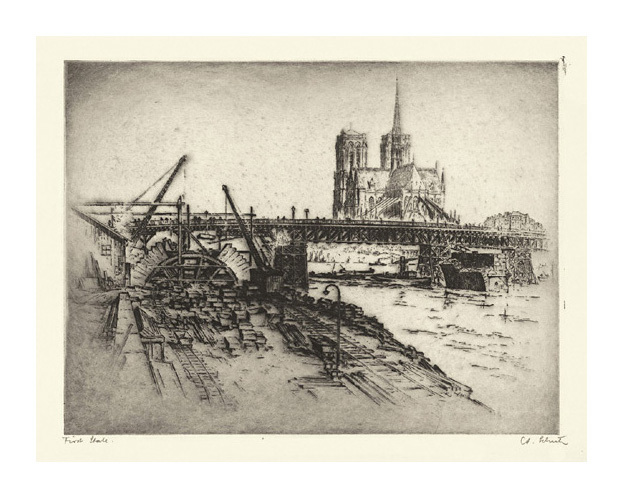 Image size 11 7/8 x 8 7/8 inches (302 x 225 mm); sheet size 16 1/2 x 12 1/2 inches (419 x 318 mm). 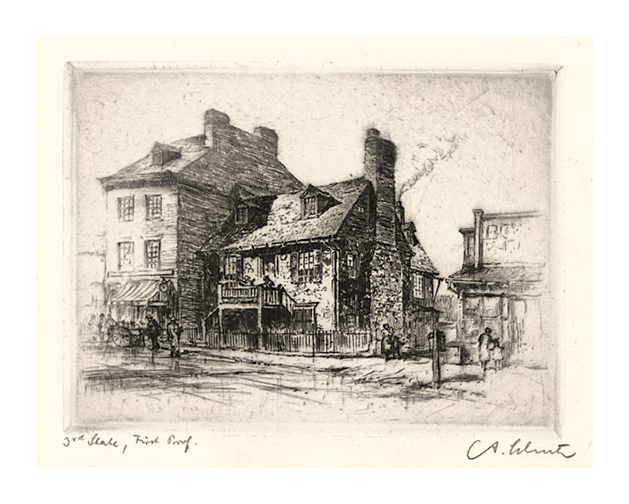 A fine, rich impression, on cream wove paper, with full margins (1 1/2 to 2 1/2 inches), in excellent condition. 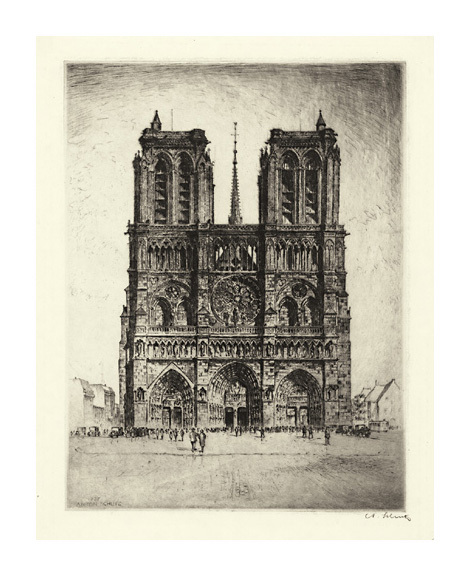 Notre Dame, Paris- - 1927, Etching. 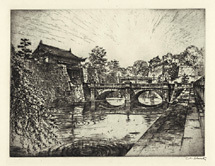 Image size 11 7/8 x 8 7/8 inches (302 x 225 mm); sheet size 16 x 11 3/4 inches (406 x 298 mm). 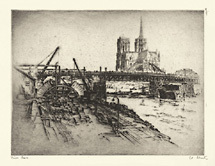 L'Abside de Notre Dame- - c.1927, Etching. Edition not stated. Signed and annotated First state in pencil. Image size 8 7/8 x 11 7/8 inches (225 x 302 mm); sheet size 11 1/8 x 15 5/8 inches (283 x 397 mm). A fine, rich impression, on cream wove paper, with full margins (1 1/8 to 1 7/8 inches), in excellent condition. 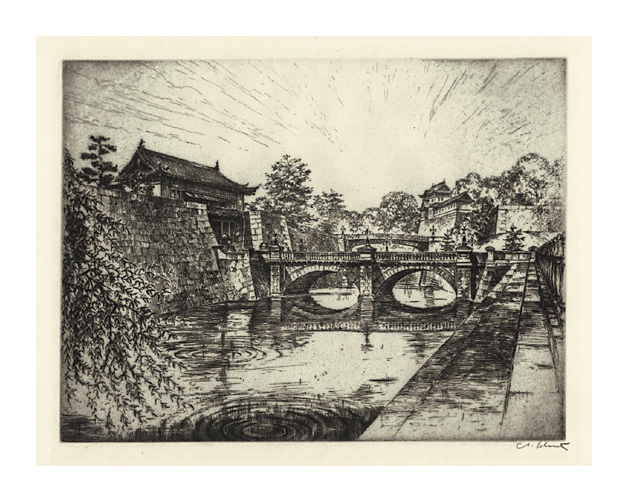 Tokyo Imperial Palace- - 1928, Etching. Image size 8 7/8 x 11 7/8 inches (225 x 302 mm); sheet size 12 1/8 x 16 1/4 inches (308 x 413 mm). 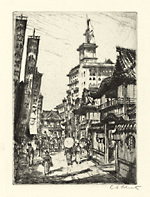 Tokyo Nijinbasho- - 1928, Etching. Image size 8 7/8 x 11 7/8 inches (225 x 302 mm); sheet size 14 x 18 1/8 inches (356 x 460 mm). A fine, rich impression, on cream wove paper, with full margins (2 1/8 to 3 1/8 inches), in excellent condition. 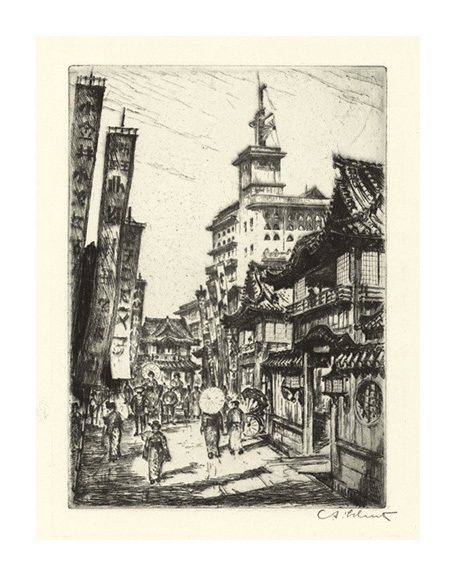 Street Scene in Tokyo- - 1928, Etching. 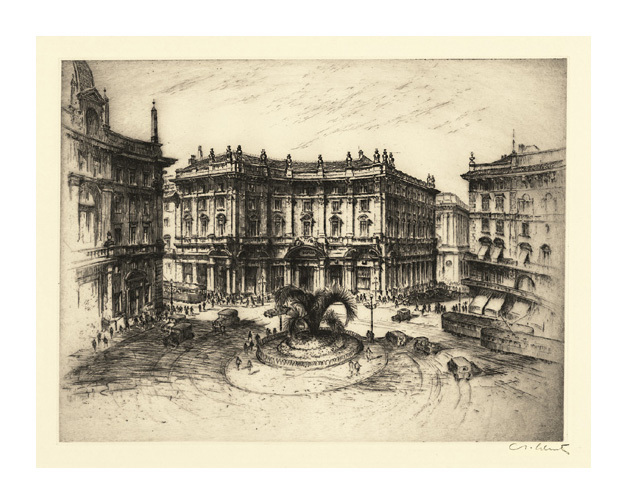 Image size 6 15/16 x 4 15/16 inches (176 x 125 mm); sheet size 11 1/2 x 7 3/4 inches (292 x 197 mm). 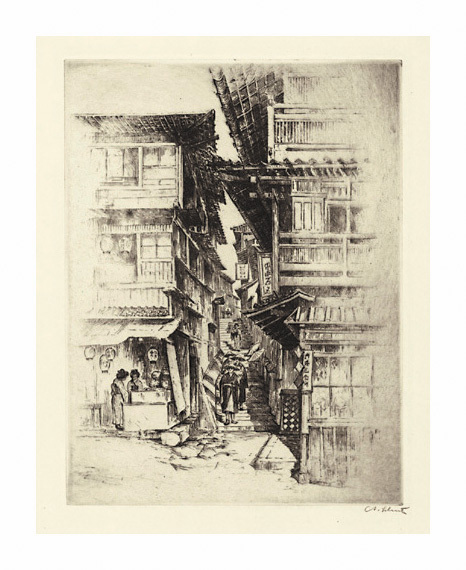 Street in Arima- - c.1928, Etching. 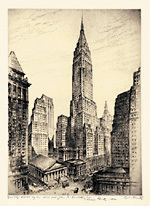 Image size 11 7/8 x 8 7/8 inches (302 x 225 mm); sheet size 18 1/4 x 13 7/8 inches (464 x 352 mm). 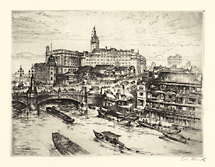 A fine, rich impression, on cream wove paper, with full margins (1 7/8 to 4 1/2 inches), in excellent condition. 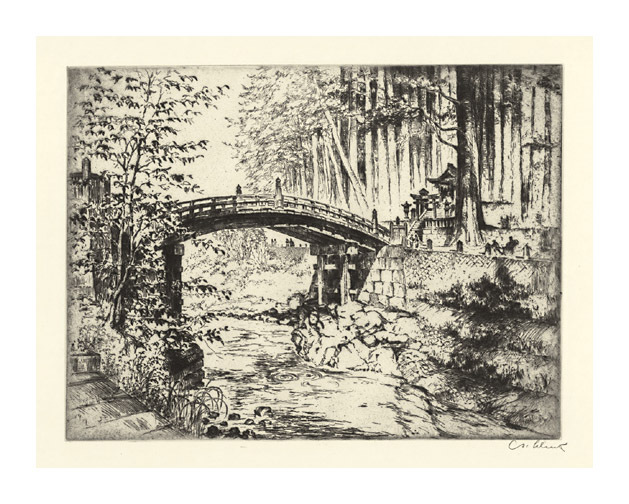 Sacred Bridge of Nikko- - 1928, Etching. Image size 8 7/8 x 11 7/8 inches (225 x 302 mm); sheet size 13 7/8 x 18 1/8 inches (352 x 460 mm). A fine, rich impression, on cream wove paper, with full margins (2 to 3 1/8 inches), in excellent condition. 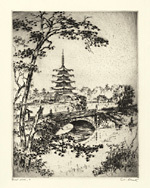 Lake and Pagoda at Nara- - 1928, Etching. Edition not stated. 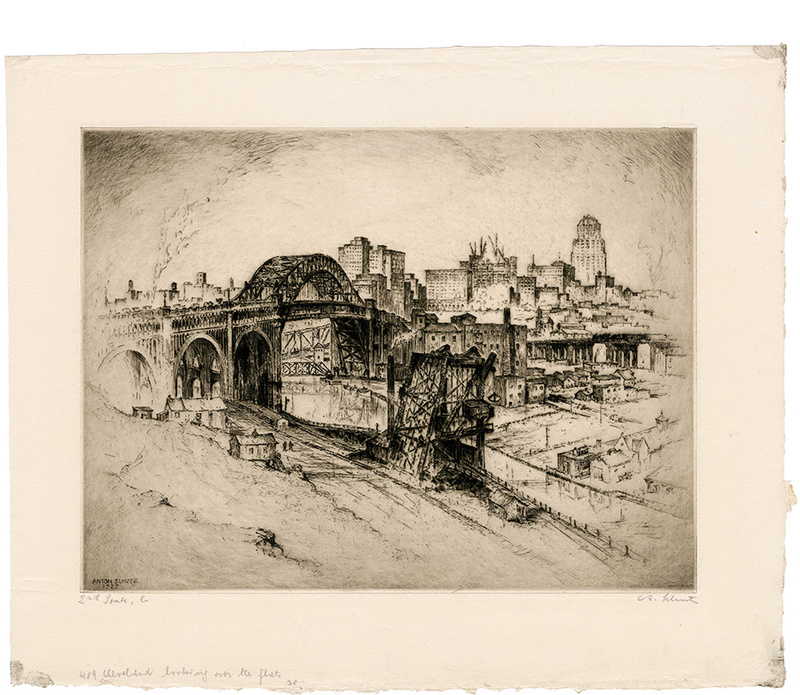 Signed and annotated First state, a in pencil. Image size 11 7/8 x 8 7/8 inches (302 x 225 mm); sheet size 17 5/8 x 12 5/8 inches (448 x 321 mm). 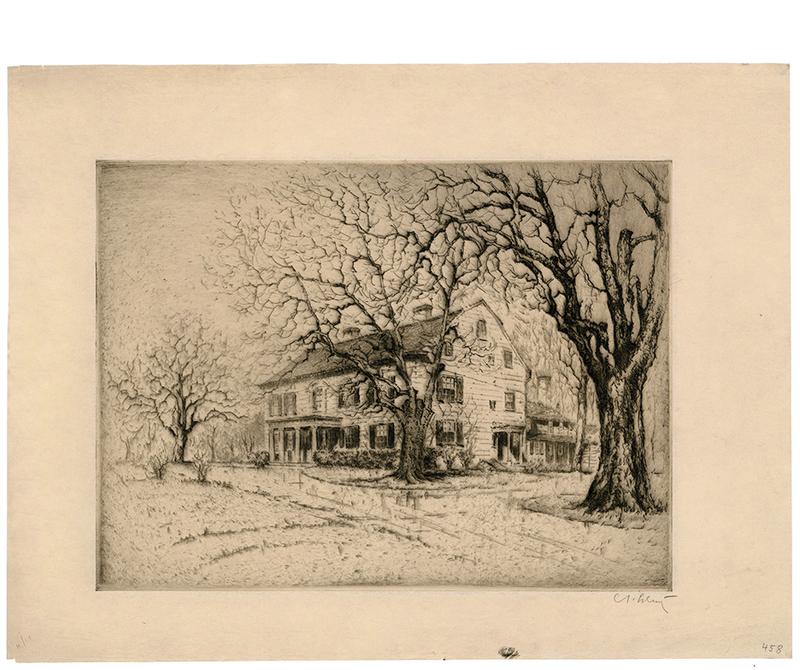 A fine, rich impression, on cream wove paper, with full margins (1 1/2 to 3 1/2 inches), in excellent condition. 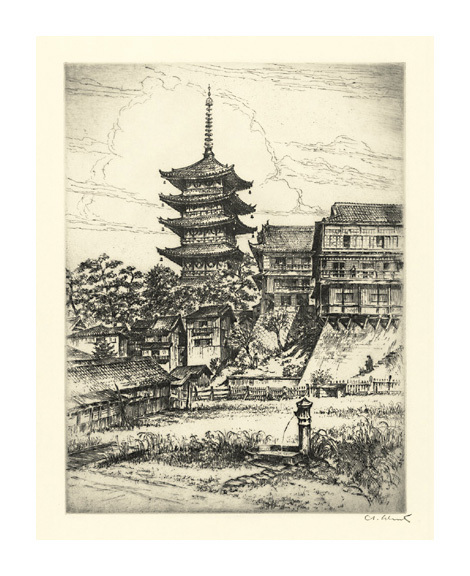 Scene of Nara- - 1928, Etching. 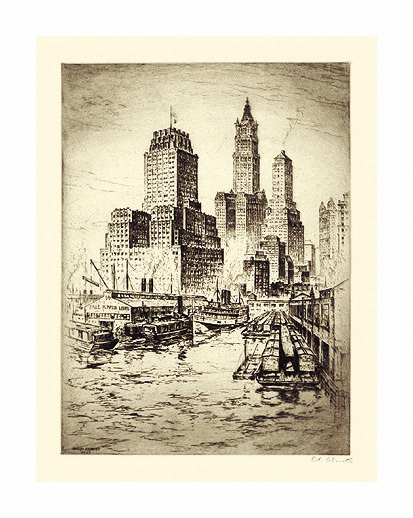 Image size 11 7/8 x 8 7/8 inches (302 x 225 mm); sheet size 17 1/4 x 12 1/2 inches (438 x 318 mm). A fine, rich impression, on cream wove paper, with full margins (1 5/8 to 3 5/8 inches), in excellent condition. 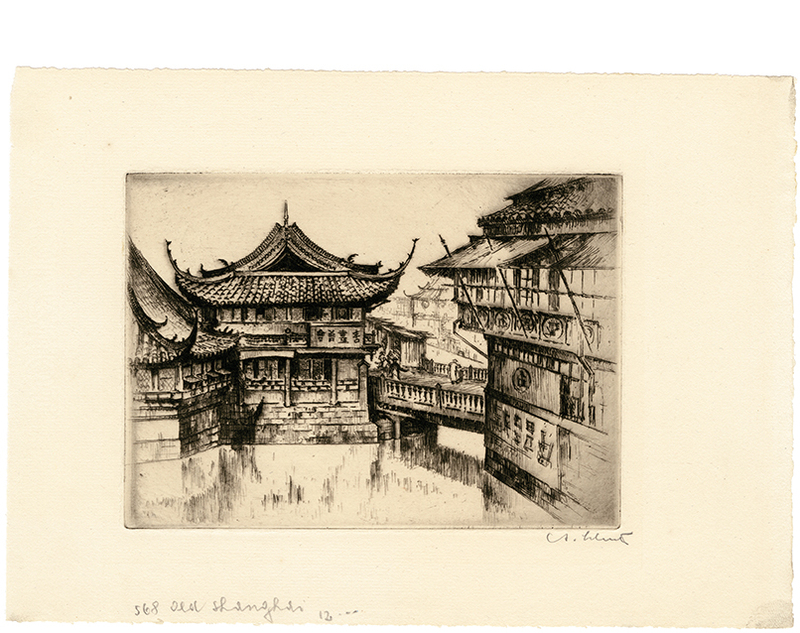 Old Shanghai- - 1928, Etching. 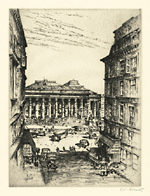 Image size 5 x 7 inches (127 x 178 mm); sheet size 7 3/4 x 11 inches (197 x 279 mm). 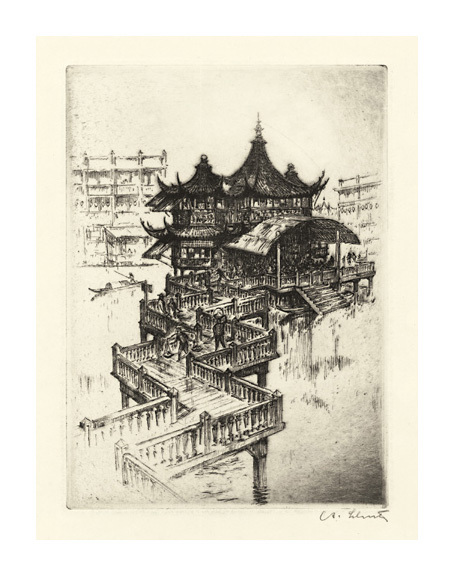 Teahouse in Shanghai- - 1928, Etching. 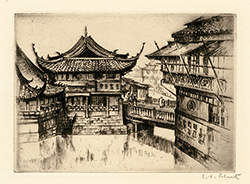 Image size 6 7/8 x 5 inches (175 x 127 mm); sheet size 16 1/4 x 10 inches (413 x 254 mm). A fine, rich impression, on cream wove paper, with full margins (2 3/8 to 7 inches), in excellent condition. 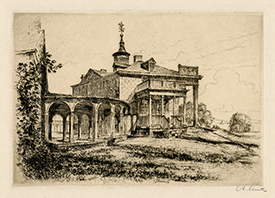 Mount Vernon- - c.1928, Etching. Image size 6 7/8 x 9 7/8 inches (175 x 251 mm); sheet size 11 1/8 x 15 3/8 inches (283 x 391 mm). A fine, rich impression, on cream wove paper, with full margins (1 7/8 to 3 1/4 inches), in excellent condition. 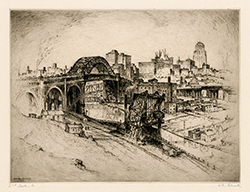 Washington - Arlington Memorial Bridge- - c.1928, Etching. Image size 6 x 11 7/8 inches (152 x 302 mm); sheet size 9 3/4 x 15 3/4 inches (248 x 400 mm). 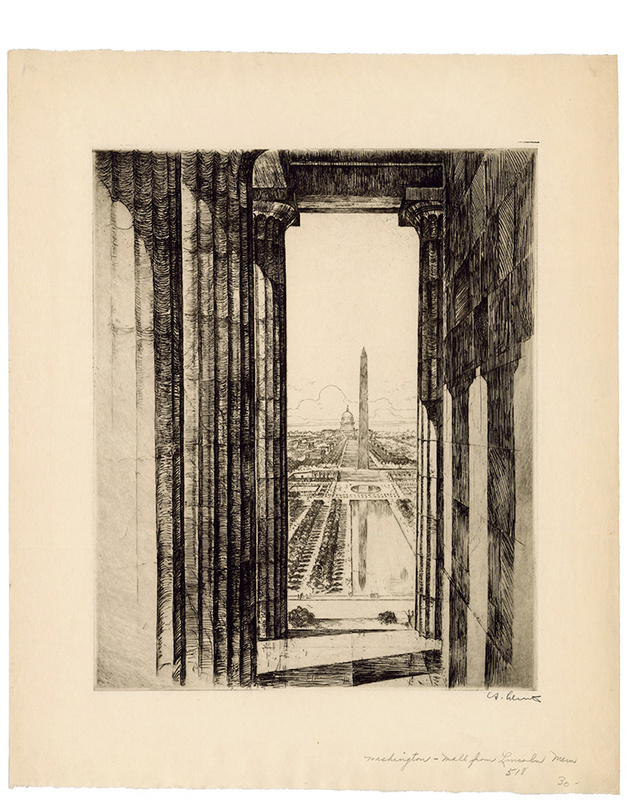 Washington - Mall from Lincoln Memorial- - c.1928, Etching. Image size 12 3/8 x 10 1/8 inches (314 x 257 mm); sheet size 16 7/8 x 13 7/8 inches (429 x 352 mm). A fine, rich impression, on cream wove paper, with full margins (1 7/8 to 2 1/4 inches), in excellent condition. 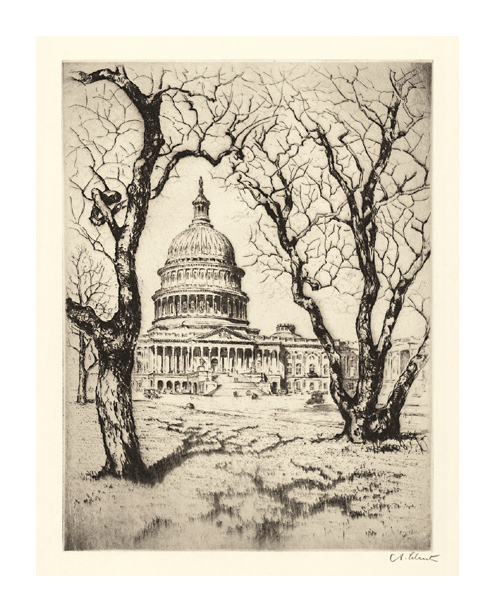 Washington, The Capitol- - c.1928, Etching. 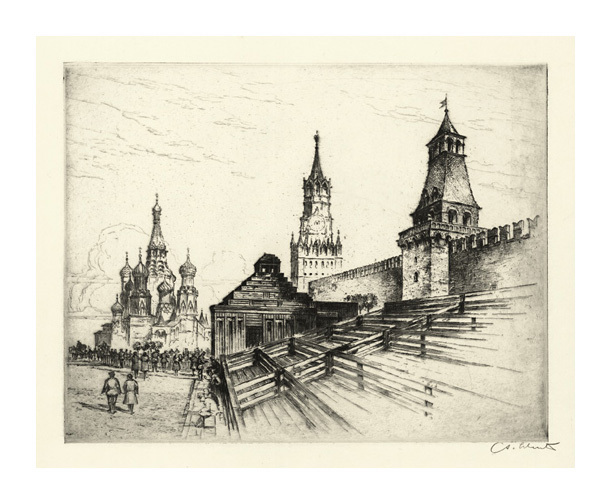 Image size 11 7/8 x 8 7/8 inches (302 x 225 mm); sheet size 14 7/8 x 11 1/8 inches (378 x 283 mm). 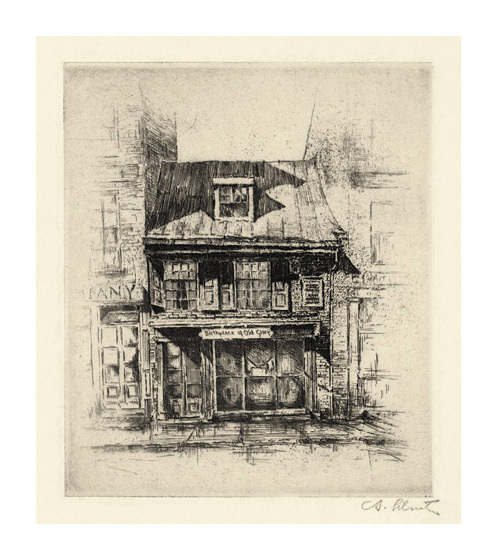 A fine, rich impression, on cream wove paper, with full margins (1 to 1 5/8 inches), in excellent condition. 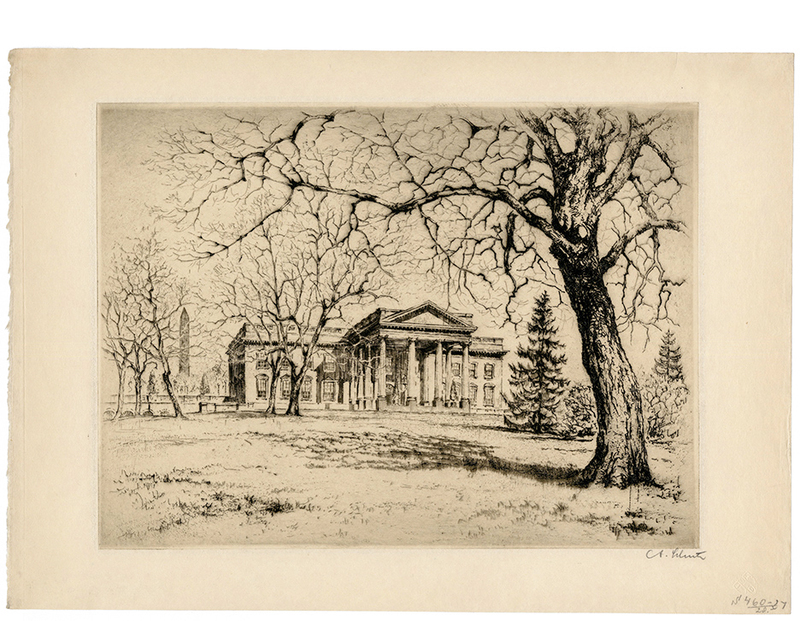 White House- - c.1928, Etching. Image size 8 7/8 x 11 7/8 inches (225 x 302 mm); sheet size 11 1/8 x 15 1/2 inches (283 x 394 mm). A fine, rich impression, on cream wove paper, with full margins (1 1/4 to 1 3/4 inches), in excellent condition. 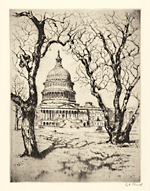 U.S. Chamber of Commerce- - 1928, Etching. 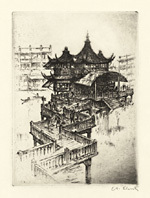 Image size 9 7/8 x 7 7/8 inches (251 x 200 mm); sheet size 14 1/4 x 11 5/8 inches (362 x 295 mm). A fine, rich impression, on cream wove paper, with full margins (1 3/4 to 2 1/4 inches), in excellent condition. 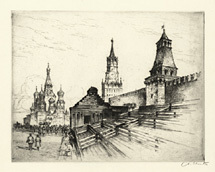 The Red Square, Moscow- - 1928, Etching. 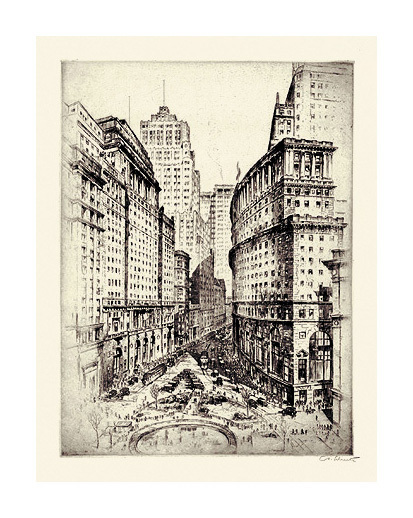 Image size7 7/8 x 9 7/8 inches (200 x 251 mm); sheet size 12 1/4 x 14 3/4 inches (311 x 375 mm). A fine, rich impression, on cream wove paper, with full margins (2 to 2 1/4 inches), in excellent condition. 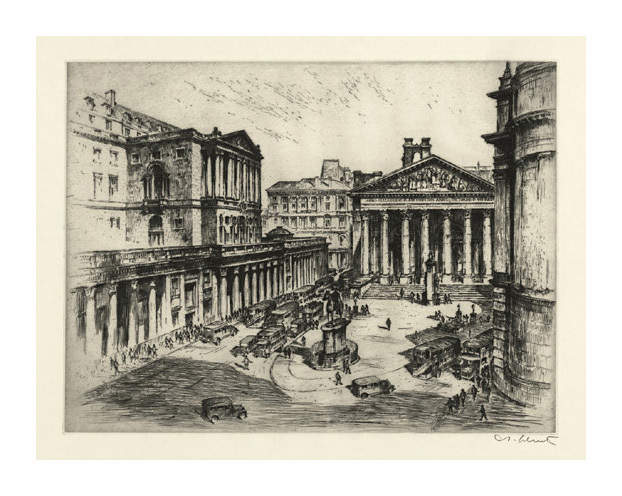 Bank of England- - c.1930, Etching. Image size 8 7/8 x 11 7/8 inches (225 x 302 mm); sheet size 12 1/8 x 18 1/8 inches (308 x 460 mm). 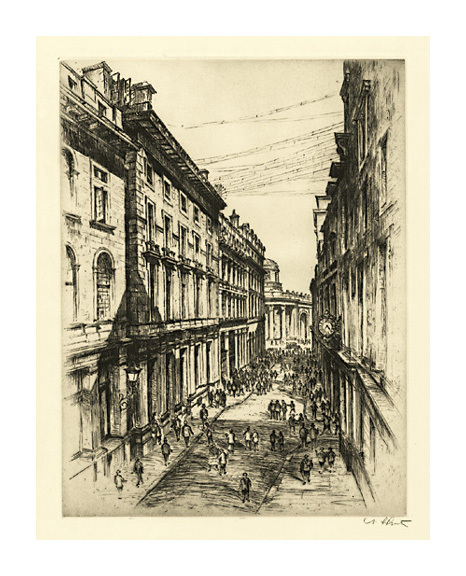 London Stock Exchange- - c.1930, Etching. 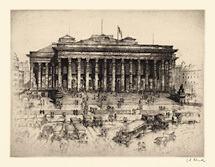 Image size 11 7/8 x 8 7/8 inches (302 x 225 mm); sheet size 18 1/8 x 12 1/8 inches (460 x 308 mm). A fine, rich impression, on cream wove paper, with full margins (1 5/8 to 3 1/2 inches), in excellent condition. 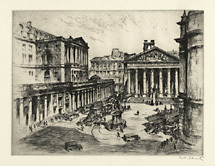 Rome Stock Exchange- - c.1930, Etching. Image size 8 7/8 x 11 7/8 inches (225 x 302 mm); sheet size 12 x 18 1/8 inches (305 x 460 mm). A fine, rich impression, on cream wove paper, with full margins (1 1/2 to 3 1/4 inches), in excellent condition. 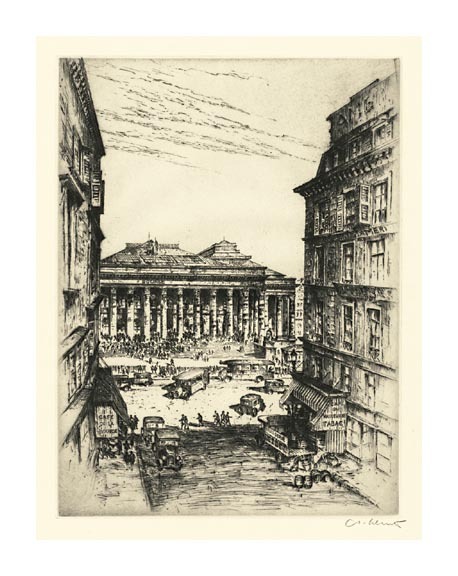 Paris Stock Exchange- - c.1930, Etching. 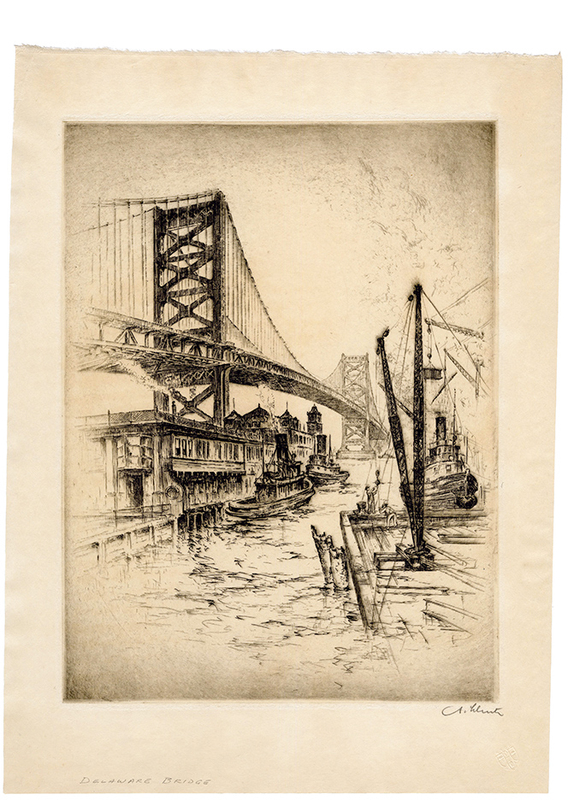 Image size 11 7/8 x 8 3/4 inches (302 x 222 mm); sheet size 18 1/8 x 12 inches (460 x 305 mm). 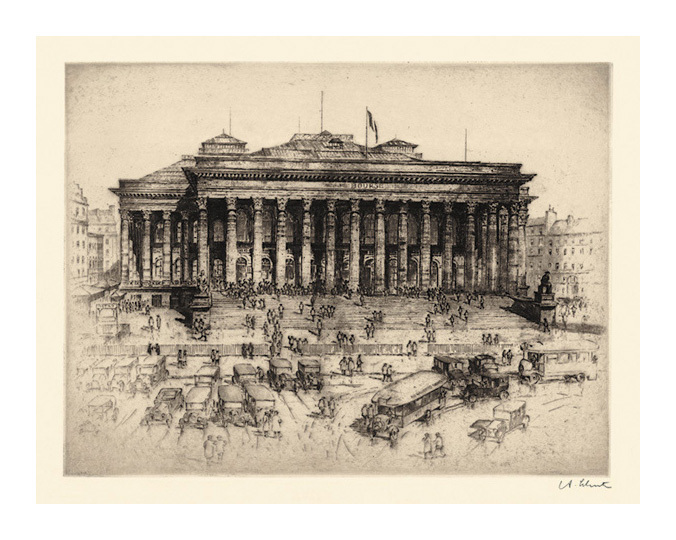 Paris, La Bourse- - c.1930, Etching. 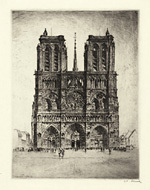 Edition 50. Signed in pencil. Image size 8 7/8 x 11 7/8 inches (225 x 302 mm); sheet size 11 1/4 x 15 5/8 inches (286 x 397 mm). A fine, rich impression, on cream wove paper, with full margins (1 1/8 to 2 inches), in excellent condition. 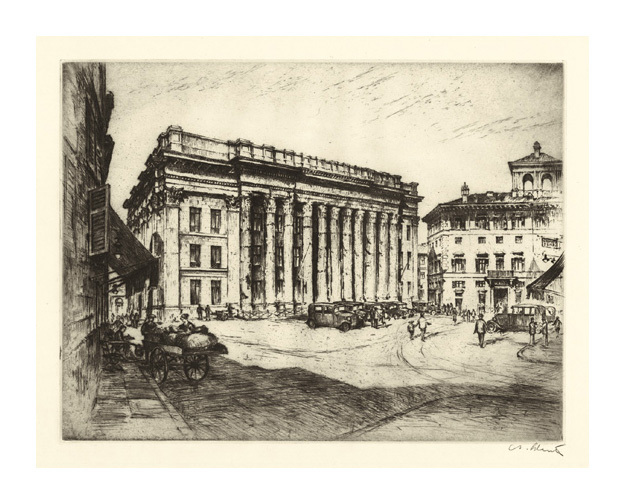 Milano Stock Exchange- - c.1930, Etching. 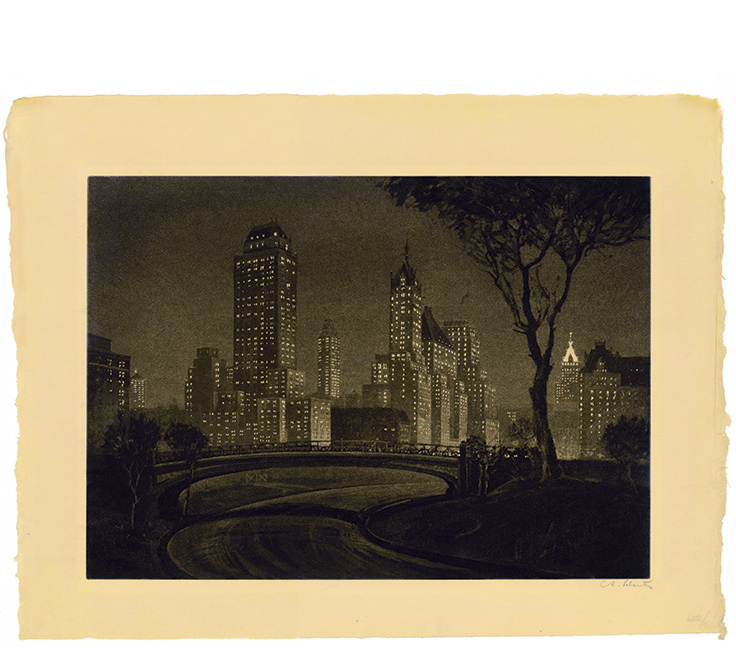 Plaza Lights- - c.1929, Aquatint. Image size 9 7/8 x 13 7/8 inches (251 x 352 mm); sheet size 12 7/8 x 17 inches (327 x 432 mm). 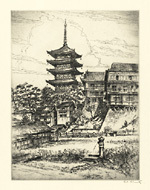 A superb, atmospheric impression, on hand-tinted yellow wove Japan, with full margins (1 1/2 inches), in excellent condition. 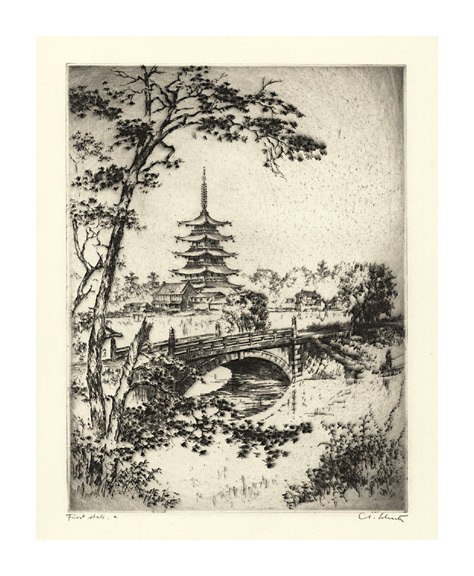 One of only a few impressions printed by the artist on his own hand-tinted yellow Japan paper. A view from New York City's Central Park, with the Hotel Pierre in the foreground; the spire-topped Sherry-Netherland Hotel, the Savoy Plaza, the Squibb Building and the Heckscher Building in the center; and the renowned Plaza Hotel on the extreme right. 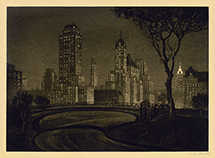 Collection: New York Historical Society. 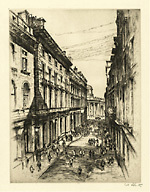 Amsterdam Stock Exchange- - c.1930, Etching. 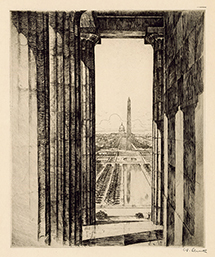 Hall of Independence- - c.1930, Etching. Image size 11 3/4 x 8 7/8 inches (298 x 225 mm); sheet size 15 7/8 x 12 1/4 inches (403 x 311 mm). 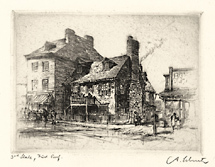 Betsy Ross' House- - c.1930, Etching. Edition 100. Signed in pencil. Image size 6 7/16 x 5 3/8 inches (164 x 137 mm); sheet size 9 x 8 5/8 inches (229 x 219 mm). A fine, rich impression, on cream wove paper, with full margins (1 to 2 1/8 inches), in excellent condition. 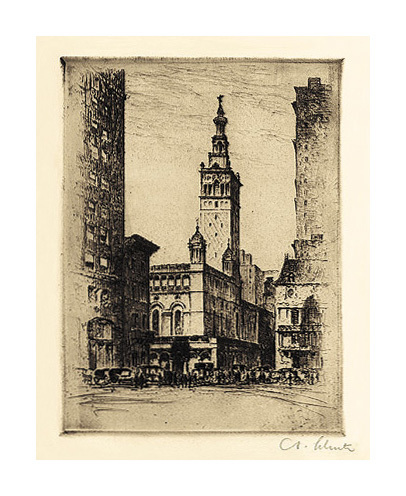 Untitled (Woolworth Building)- - 1930, Etching. Edition 100. Signed and dated in pencil. 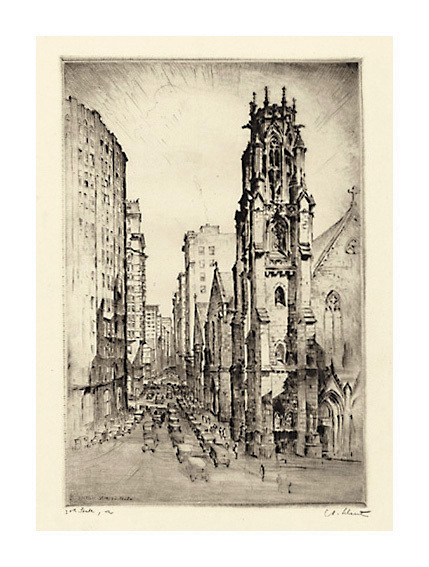 Inscribed Specifically selected by the artist for John N. Haslett, Esq Anton Schutz, 1930. in pencil. 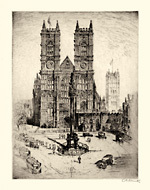 Image size 13 7/8 x 9 3/4 inches (352 x 248 mm); sheet size 19 x 14 inches (483 x 356 mm). A fine, rich impression, on cream wove paper, with full margins (2 to 3 inches), in excellent condition. 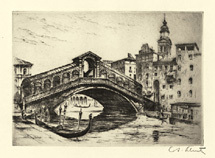 Maria de la Salute, Venice- - c.1930, Etching. Image size 5 x 6 7/8 inches (127 x 176 mm); sheet size 10 7/8 x 13 3/4 inches (229 x 308 mm). A fine, rich impression, on cream wove paper, with full margins (2 3/4 to 3 1/2 inches), in excellent condition. 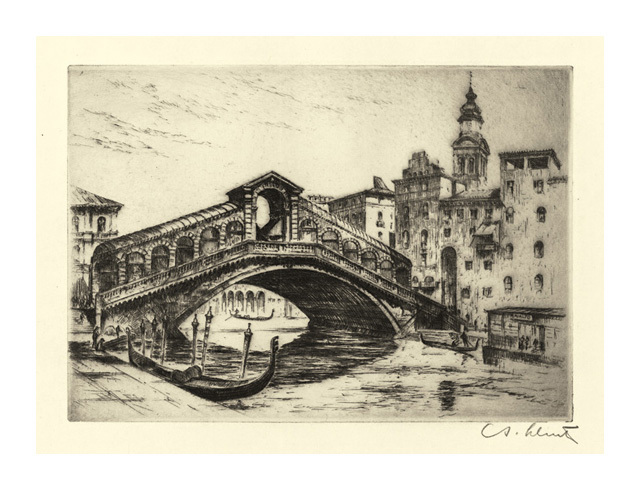 Venice, Rialto Bridge- - c.1930, Etching. 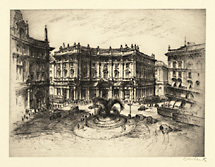 Image size 5 x 6 15/16 inches (127 x 176 mm); sheet size 9 x 12 1/8 inches (229 x 308 mm). A fine, rich impression, on cream wove paper, with full margins (2 to 2 5/8 inches), in excellent condition. 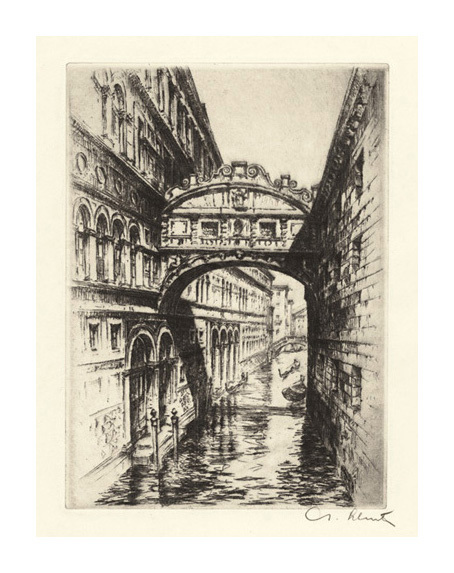 Venice, Bridge of Sighs- - c.1930, Etching. Image size 6 7/8 x 4 15/16 inches (175 x 125 mm); sheet size 12 1/2 x 9 3/4 inches (318 x 248 mm). A fine, rich impression, on cream wove paper, with full margins (2 1/4 to 3 inches), in excellent condition. 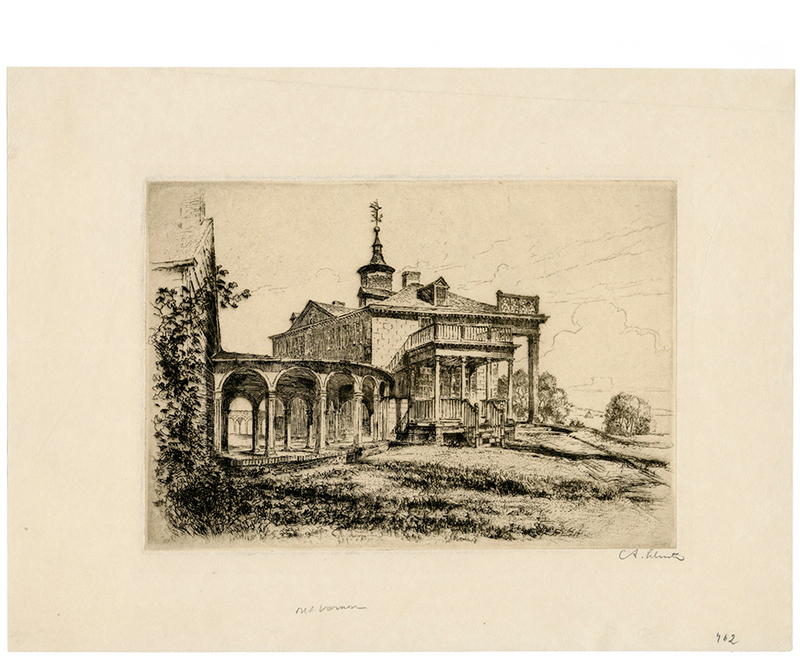 King Mansion, Jamaica- - c.1930, Etching. Image size 8 7/8 x 11 7/8 inches (225 x 302 mm); sheet size 12 1/4 x 17 1/8 inches (311 x 435 mm). 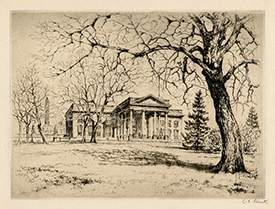 King Mansion located in Jamaica, Queens, NY, also known as the Rufus King House, was designated as a New York historical landmark in 1966. Rufus King was a Massachusetts delegate to the Continental Congress (1784-86), an anti-slavery advocate, and three term senator from New York.